Like the first season of The Red Panda Adventures, season two is an incontestably enjoyable frolic through original, but familiar, comic book territory. The Red Panda and his faithful driver, Kit Baxter (AKA Flying Squirrel), patrol Toronto rooftops by static boot, and whunk their way through superhero sized pneumatic tubes concealed about the city, fighting wrongdoers. New and old supervillains, voiced by professional audio actors, execute egregious crimes that can only be foiled by a prosperous panda with hypnotic powers and a volitant rodent with a mean right-hook. The second season has more of what made the first season so terrific. Standouts in traditional storytelling include episode 14: The Sunday Supplement, Episode 16: The Sweet Tooth, and Episode 20: Monkeyshines. The latter introduces a terrific new antagonist called “The Mad Monkey,” an arch-scoundrel on par with DC Comics rogues like The Joker and The Penguin. Season two also has a few episodes that expand the storytelling in different directions. Episode 18, for instance, was the long requested Secret Origins episode – in which we discover the first ever meeting of Panda and Squirrel. Episode 15: When Darkness Falls tells its tale from the perspective of a young boy in a city with a vigilante superhero. And episode 24: The World Next Door posits the existence of an alternate universe in which the Red Panda is a Nazi fighter and the Flying Squirrel is a teenage boy! 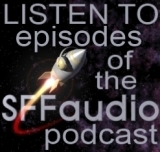 In naming this show an SFFaudio essential I’ve got to cite both the writing and the production. The acting here is absolutely tops. Recording the scenes in-studio, together, works. The writing is perky, puissant, perfect, and seemingly effortless. The series scribe, Gregg Taylor, is a master storyteller. Congrats to them on that, as well as congrats for having an awesome second season! I’ll have to third that SFFaudio essential attribution. My personal fav podcast.